The client is a homebuilder in Atlanta, Georgia who builds neighborhoods with houses in the $220,000 to $1,000,000 market. Their web site is outdated and the webmaster is unresponsive to their attempts at communicating. Create a new web site with content management features so the client can maintain the parts of their web site that are constantly changing. Create a new web site with content management features so the client can maintain the parts of their web site that are constantly changing. This calls for an extensive data structure to manage all of the neighborhood information scaling down to the details of each individual floor plan and each individual home. XI Interactive created a PHP/MySQl solution with extensive data structure. Site visitors are able to drill in on neighborhood information in a specific area or use search function to get listings of homes that match their requirements. The solution is complete with a Google Maps API to assist visitors in locating neighborhoods of choice. Subdivision real estate agents are also maintained in the database and neighborhood-specific contact information is available on every page as needed. Contact emails and survey forms are routed to multiple company personnel. A back end administration panel allows the company to login and manage all of their own housing inventory and development status. This ensure timely updates of the hundreds of homes that the client has in development and for sale at any given time. 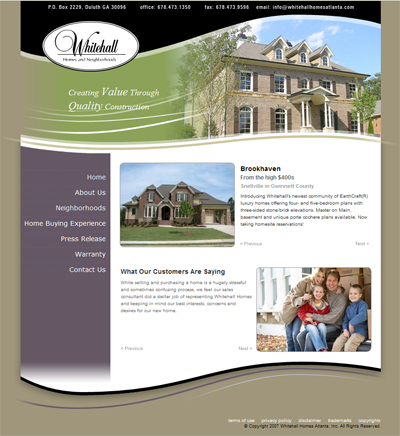 The client is very please with the web site and continues to enhance the site with further development.